"If you see God, ask him why he stopped loving us." I've been enamored with the works of author Stephen P. Keirnan since reading his debut novel The Curiosity, back in 2013. His sophomore novel The Hummingbird, showed his flexibility as an author and cemented his place as one of my "must reads." I was eager to get my hands on a copy of his latest work, The Baker's Secret, and I gladly jumped at the opportunity to read the advanced copy that his publisher provided. True to form, Kiernan managed to present another poignant and moving story that had me reading into all hours of the night. The year is 1944 and Nazi Germany has invaded Normandy. Emmanuelle, Emma to everyone in her village, has been the apprentice to the town's baker for several years now. Her natural dexterity in the kitchen saw her become the baker's right-hand-man and even begin to surpass his expertise. The German occupation has not been kind to Emma. Her mentor was senselessly murdered in the town square by the Nazi's, and her father was imprisoned. Now Emma is left to run the bakery and care for her grandmother. Emma's reputation as a master baker eventually gains the attention of the occupying army. They provide her with a meager supply of rations in exchange for daily loaves of freshly baked bread. Like clockwork, Emma's days become a ritual of servitude to the people who have destroyed her home. Amongst this dreary existence, a ray of hope begins to shine in the form of quiet resistance. Emma begins to supplement her flour with ground up wheat, allowing her to produce two extra loaves to feed her town. This subtle act of defiance ignites hope in the village. They begin to beleive that one day the allies will relieve them of this horrific occupation. But how long can Emma keep this up? If even one soldier suspects her of trickery, the entire town could pay the price. Can she maintain this opposition long enough for the justice to win out? 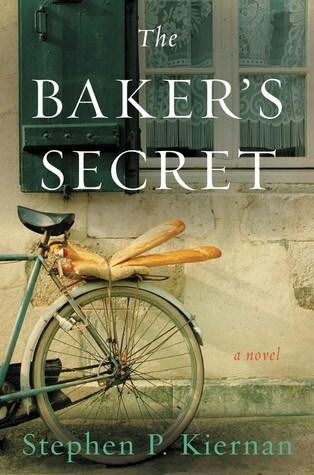 The Baker's Secret sees Stephen P. Kiernan write his most mature and emotionally satisfying novel to date. Unlike his previous works that shifted perspectives and time periods, this novel follows a straightforward narrative that allows for the nuanced development of the main character. The subject, specifically WWII, has been explored in countless other works of literature, but Kiernan brings a new angle to this tried and true genre. His background as a journalist allows him to effortlessly weave historical facts into his captivating fiction. Emma is a character who is wrought with a wonderfully intriguing duality. On the one hand, her will to resist the Nazis and provide for her town makes her into a figure of hope in their eyes. At the same time, she faces heavy doubt that her village will ever be free again. This conflict of emotion drives the development of her character and highlights what must have been a common thought process to those facing the reign of the Nazi army. It is human nature to resist oppression, even if that resistance is logically futile. Kiernan reinforces this internal strife with the physical suspense of the actual war. This combination makes for a page-turning read that is equal parts war thriller and character study. The quiet confidence of Kiernan's writing makes for an exceptional read that captured both my imagination and emotions. With the addition of The Baker's Secret to his already stellar bibliography, Stephen P. Kiernan has proved that he is a master storyteller who balances emotional complexity and engaging narrative with ease. This entry was posted on Wednesday, May 3, 2017 and is filed under Book Review,Fiction,Stephen P. Kiernan,The Baker's Secret,The Curiosity,The Hummingbird,WWII. You can follow any responses to this entry through the RSS 2.0. You can leave a response.